The Universal Peace Federation extends its best wishes to all Ambassadors for Peace of all faiths at the beginning of Ramadan. Now more than ever, the world is in need of the peace that can only come when we all recognize that we are indeed One Family Under God. As explained by Prophet Mohammed, fasting during the month of Ramadan is one of the five pillars of Islam, the others including witness to God, prayer, almsgiving and pilgrimage. UPF-Taiwan is seeking donations to provide relief for people devastated by typhoon Morakot which caused the worst flooding in half a century. The number of casualties stands at 136, but is expected to increase. Trinidad and Tobago - We offered character education programs to children in the village of El Luengo and young athletes in Port of Spain, the capital. This was the second year that the Universal Peace Federation has sent peer educators from the US to this Caribbean island off the coast of Venezuela. Amsterdam, the Netherlands - The fifth World Congress of Families was held in Amsterdam this month. Individuals and organizations from various backgrounds and communities shared the common goal of the World Congress of Families, "to affirm that the natural family is established by the Creator and essential to good society." Subscribe to our new Chapter RSS Feeds. Click on the link below to find your chapter and keep up-to-date with our work by subscribing to the RSS. Order the UPF Promotional booklet: Vision and Leadership at a Time of Global Crisis. Now for a limited time pay only for shipping and handling! The UPF Arabic language page is now available! Free PDF of UPF Today. The newest July edition of UPF Today in Engish and Spanish is now available on our website. Get your free digital copy today! Seville, Spain - In town for the finals of the fourth Peace Cup, the premier international club soccer competition he launched in Korea six years ago, the UPF Founder Rev. Dr. Sun Myung Moon took the opportunity to share a vision of peace for Europe and the world at a celebratory program in Seville. In addition to Ambassadors for Peace from throughout Spain, the large crowd included delegates from more than 30 European nations and from as far as the United States, Korea and Japan. Seoul, Korea - Speaker videos from the recent International Leadership Conference held in Seoul, Korea are now available for viewing on our site. Also available are photos for downloading or ordering online. Amman, Jordan - Many of the Iraqi refugees I work with tell stories fleeing repression from the regime in Iraq and the opposition militias. As their period of stay in Jordan has extended beyond five, six, and even seven years, they feel increasingly hopeless and desperate. Most of them have no hope of either being resettled or going back to Iraq and are thus stuck with complicated living arrangements in Jordan. To make matters worse, many are in the country illegally, meaning they cannot get work permits or public education beyond high school. Cotonou, Benin - Dignitaries from all walks of life and Ambassadors for Peace from West Africa converged in the capital of Benin for an international seminar on peace and leadership. The event was organized by the UPF of West Africa under the patronage of the Constitutional Court of Benin, the Ministry of Family and National Solidarity, and the Ministry in Charge of Relations with Institutions. 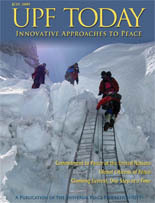 The video sessions from the World Summit on Peace in Korea held in May-June 2009 are now available for purchase. Gangtok, Sikkim, India - The Universal Peace Federation of India honored Dr. Pawan Chamling, Hon. Chief Minister of Sikkim, with the Leadership and Good Governance Award on July 6. The ceremony took place in the "Chintan Bhawan" Government Hall in Gangtok, the picturesque capital of Sikkim. In June/July, UPF.ORG had visitors from over 170 countries. Come visit our site and put your own county in the top ten! Jerusalem, Israel - Twenty-six youth from Austria, England, France, Germany, Italy, Norway, Sweden, America, and Israel gathered in Jerusalem for a taste of Israeli and Palestinian cultures and to learn through experience about transcending barriers of religion, ethnicity, and nationality for the sake of peace. They took part in service projects, dialogues with Israeli and Palestinian youth as well as visiting historic sites. Kathmandu, Nepal - H.E. Dr. Ram Baran Yadav, President of the Federal Democratic Republic of Nepal, cut the ribbon to inaugurate the "International Conference for Solidarity with Nepal" organized by the Universal Peace Federation (UPF) and the Parliamentarians' International Forum in Kathmandu July 17-19, 2009. Geneva, Switzerland - Debates marked the end of the 2009 UN Economic and Social Council Annual Ministerial Review in Geneva. The first debate X-rayed the current social situation of the planet, showing the prospects for the future. A special focus of this X-ray was to explore the most vulnerable areas, where the suffering is already strong, or which may start to ache in the near future. " Frankfurt, Germany - Creationists and evolutionists worldwide are engaged in heated debates concerning the correct understanding of human development. Did God create humans? Or are we a product of random mutation and selection? Seoul, Korea - As the world moves closer to the 21st century's second decade, the goal of world peace seems as elusive as ever. With significant differences in beliefs and practices, not to mention language and culture, religion can seem to be a force for division, but delegates from 84 nations to the International Leadership Conference resolved to put aside religious differences in search of deeper unity. Kuala Lumpur, Malaysia - No one's too young to be a peacemaker. Through collecting donations of 10 sen (a Malaysian coin), Malaysian children have proven that! Within two months, a total of RM 143,730.10 (US$ 40,700) was collected by the united effort of about 500,000 children in this southeast Asian nation. Abuja, Nigeria - The Africa Youth Leaders Peace Summit was convened in commemoration of the 2009 African Liberation Day and held at the Economic Community of West African States (ECOWAS) in Abuja, Nigeria, from June 2 to 5 with the theme of the Role of Youth in achieving the Millennium Development Goals & Regional Integration of Africa. Seebenstein, Austria - For the last several years, UPF-Austria has made it a tradition to organize a small Peace Festival at the time of the summer solstice. This year it was combined with a June 20 conference on "20 Years Since the Fall of the Iron Curtain." Cagayan de Oro, Philippines - As more and more communities become vulnerable to armed conflict, there was a need for the steering committee of the new Mindanao Peace Initiative and their respective constituents to converge and develop solidarity in their peace efforts. Thus, a Mindanao Peace Initiative Steering Committee Conference was held June 4-6, 2009 at the beautiful and peaceful Ecotourism Village in Cagayan de Oro City. Kathmandu, Nepal - On May 20, three Nepali climbers reached the summit of Mt. Everest and unfurled a banner that read "Mt. Everest Expedition for a New Constitution and World Peace - 2009." People climb Mt. Everest for many reasons, often for adventure or to win glory for themselves. But what about climbing the highest mountain in the world in order to help inspire the world's newest republic as it is writing a national Constitution? Suva, Fiji - Religious leaders of the Fiji Islands, which is a multi-racial and multi-religious society, gathered at the Nasinu Town Council Chamber on June 13, 2009 to discuss the values of "marriage and family." Perspectives were shared on this theme as representatives from each religious organization met to empower themselves as instruments for peace. The United Nations General Assembly is meeting in New York to discuss the world financial and economic crisis and its impact on development, especially on the poorest nations of the world. But the wealthiest nations in the world are staying away in droves, leaving the poorer nations to plead their case largely alone. Lima, Peru - During a time of violent clashes over plans to open up Peru's northern Amazon region to development, UPF-Peru held a forum in the Congress on a culture peace. June 2009 has proved to be a difficult month for Peru. Following a long period of disagreement between the Alan Garcia government and the indigenous people in the Amazon forest in the north of Peru, the native residents blocked the main roads in protest against plans to allow oil and logging companies to enter what they consider to be their own land. Unfortunately, the fighting that followed this blockade left 24 policemen and 11 local people dead. Free PDF of UPF Today. Get your free issue of UPF Today, the latest is in Chinese! Ottawa, Canada - "What is called for in the 21st century is unprecedented cooperation between religions and cultures," said Dr. Ian Prattis, Professor Emeritus at Carlton University, as he opened a wide-ranging discussion about the Universal Peace Federation's proposal for an interreligious council at the UN. "Let us reach out our hands to people of other traditions and walk through our century hand in hand." There is an enormous deficit within the United Nations in not acknowledging the significant role of religions nationally and internationally. An interreligious council on an international basis can be one of the most effective mediums to promote peace. We will consider issues of admission, representation, and structure. In May, UPF.ORG had visitors from 165 countries. The top ten is topped by the United States. First time in the top 10 are Brazil and Iceland! Come visit our site and put your own county in the top ten! Geneva, Switzerland - In the sixth event in an ongoing "Peacebuilding and Human Rights" conference series, the Universal Peace Federation, together with the Geneva Interfaith Intercultural Alliance and the Women's Federation for World Peace International, sponsored two sessions at the United Nations in Geneva on May 15 to mark the International Day of Families. Ukraine - The "Mom, Dad, Me - Sporty Family" all-Ukrainian Festival finals were held May 14 to 17 in the picturesque Crimean peninsula. The activities were organized by the "Sports for All" all-Ukrainian center for the population's physical health and by the Universal Peace Federation under the initiative of the Peace Dream Foundation. Zagreb, Croatia - On May 4th, 2009, UPF Croatia held its first Global Peace Tour event, under the theme: "A new vision of peace for the 21st century". For this special occasion we had as the main speaker Mr. Mark Brann, Secretary General of UPF in Europe, as well as five other speakers from the ranks of our local Ambassadors for Peace. Niamey, Niger - The president of the Niger chapter of the Universal Peace Federation, El Hadj Abdou Daouda died in an accident on May 15, 2009. He was Minister of National Competitiveness and the Fight Against the High Cost of Living. In addition to playing a key role as Ambassador for Peace in Niger, Minister Daouda attended the launch of the Universal Peace Federation in Nigeria. In 2008, he represented Niger at the 25th Anniversary of The Washington Times and at an International Leadership Conference in Korea. Minister Daouda was enroute to his home town of Zinder-Gafati to launch the construction of a new road. Prime Minister El Hadj Seyni Oumarou attended the funeral, along with a delegation of National Deputies and a large crowd of people who gathered to pay their respects. In April, UPF.ORG had visitors from 165 countries. The top ten is topped by the United States. Several countries have moved up in the ranks including Russia, the Philippines, and Malaysia. Come visit our site and put your own county in the top ten! New York, USA - The UPF organized over 55 celebrations of the United Nations Day of Families in more than 22 nations, building on the theme "Creating a World of Peace, One Family at a Time." 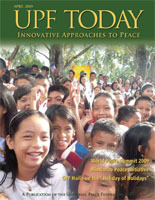 The final event of the two-week observation took place May 18th at the United Nations Headquarters in New York and marked the conclusion of the UPF Global Peace Tour 2009. Washington DC, USA - Combine the warm and cozy feeling of a family reunion and the cultural splendor of the beautifully exotic nation of the Kingdom of Bahrain and you will arrive at the unique experience had by all who attended the International Day of Families Celebration, Friday, May 15 at the Bahrain Embassy in Washington, DC. Several events were held in Russia to commemorate the UN International Day of the Families. Locations included Moscow, Nizhny Novgorod, Rostov-on-Don, Ryazan, St. Petersburg, Tver, Vladivostok, and Yekaterinburg. Events ranged from student lectures, service projects involving orphanages and a fashion show. The UPF has created a portal page for the United Nations International Day of Families that was held worldwide on May 15th. The UPF held several events around the world to commemorate this day. To find out more on the IDF come visit our page or the UN Official site. See our reports from around the globe.